With the great lunar halo display from the beginning of the month still fresh in memory, Marko Mikkilä drove again to Sotkamo last monday. This time the catch was less spectacular, but something was nevertheless seen in the spotlight beam. Mikkilä managed place the lamp to a record negative angle of about -30° and photographed subsun and subparhelia as shown above. Click on the image to see more photos and also two videos. Sweet subparhelia!! since subparhelia formed did you look for subkern and other halos? I know one thing to get good subparhelia like that if you used a large divergent floodlight that would of made awesome superparhelia that night. Great photos, thanks. My favorite is DSC3143. Sorry, Marko R, I am going to call the upper halos in the photo the 'superparhelia' and 'superlamp'; I think it is safer and less confusing in the long run. Marko M, did you notice any curvature (toward or away from you) in the superparhelia and superlamp? That is, could you sense that they were falling away from you as you looked higher on the halos? 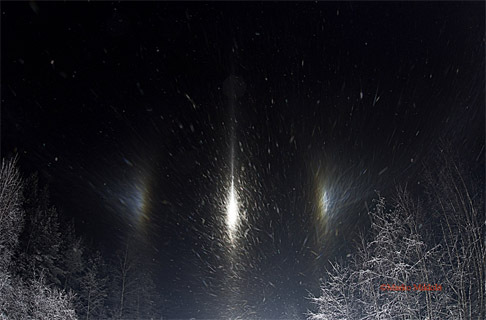 Or, put another way, did the bright parts of the superparhelia and superlamp seem really close? On superlamp i saw curvature. But im not sure with superparhelias... maybe. Falling away is correct term. Marko M, if you saw the curvature, then aren't you the first to do so? Or are all of you seeing it?